Boil potatoes, remove skin and mash it. Take a bowl, add mashed potatoes, apples, sugar, cinnamon powder, cardamom powder, salt, and mix it well. Add tapkir and mix it well. Preheat oven. Take a baking tray, grease it will ghee and pour the mixture. Bake it on 180 degree C for 30 minutes. Make slices of bananas. Take a pan, add ghee and sugar. Stir it continuously for about a minute. 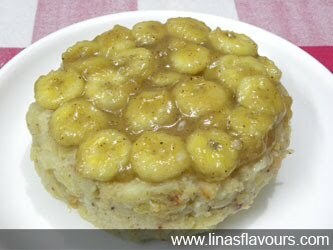 Add bananas to sugar syrup and cook it till it turns light brown. Pour the caramelized bananas on the cake and serve it immediately. It will be not be exactly like a spongy cake and will be more like pudding. Slightly warm tastes great.